Toshiba on Thursday said that its latest and largest hard drives for high-end desktops and NASes will be available later this month in the US. The new N300 and X300-series HDDs will offer not only increased capacities, but also provide improved performance. 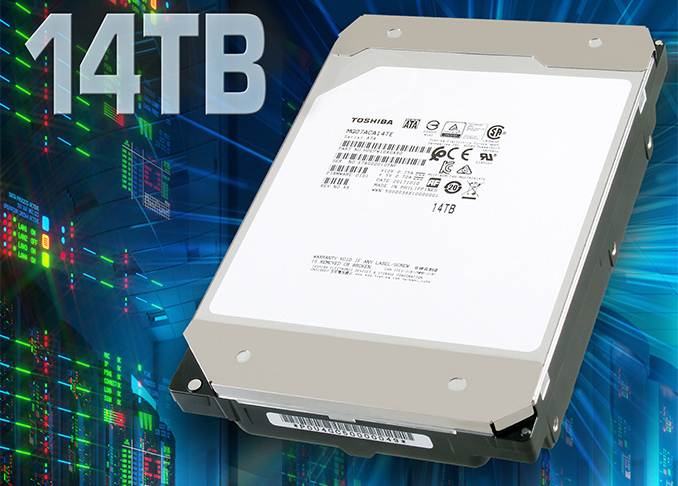 Available in 12 TB and 14 TB capacities, Toshiba’s latest N300 and X300-series helium-filled hard drives are built around 1.56 TB PMR platters from Showa Denko, with the drives incorporating up to 9 of the platters. The drives generally resemble Toshiba’s enterprise-grade MG07-series HDDs introduced last year: they feature a 7200 RPM spindle speed, a 256 MB cache buffer, and a SATA 6 Gbps interface. As for performance, Toshiba has rated the maximum sustained data transfer speeds for the drives at 260 MB/s for 14 TB models and 253 MB/s for 12 TB SKUs. Power wise, expect the HDDs to consume around 9W. It is particularly noteworthy that both HDDs feature top and bottom attached motors to minimize vibrations (Toshiba calls the feature Stable Platter Technology). Meanwhile, being aimed at different kinds of applications, the new HDDs are not just rebadged MG07 products. Toshiba’s N300-series 12 TB and 14 TB hard drives for NAS (aka MN07-series) with up to 8 bays are outfitted with rotational vibration (RV) sensors to ensure consistent performance in vibrating multi-drive environments. By contrast, desktop-oriented X300-seires 12 TB and 14 TB HDDs do not have RV sensors since modern desktops hardly use multiple hard drives. Meanwhile, neither of the new HDDs are equipped with environmental sensors, persistent write cache (PWC) with power loss protection (PLP) technology, or other enterprise-grade features. When it comes to rated workloads and durability, Toshiba’s N300 drives are rated for 24/7 operation, up to 180 TB per year workloads and 1 million-hour MTTF. The X300 HDDs are not officially designed for 24/7 operation, but it still features improved reliability courtesy of its Stable Platter tech and the enterprise nature of the platform. All the new drives will be covered by a three-year limited warranty. Toshiba’s new N300 and X300-series HDDs will be generally available in the US later this month. The new N300 and X300 hard drives are priced equally despite being slightly different. The 12 TB SKUs cost $429.99, whereas 14 TB models carry a $539.99 price tag. UPDATE 12/8: Adding official MSRPs of the products. Uh, no this has 4k sectors. HDD Manufacturers moved to Advanced Format (4K) in 2011, and no one has made a 512b drive since then.